Line 8 small 5cm (2-inch) diameter dariole moulds or 50ml capacity small cups with plastic wrap. Combine all the ingredients, except for the orange juice and the coconut oil, in a food processor and blend until the mixture forms into a crumb-like consistency. Remove from the food processor, place in a large mixing bowl and add the orange juice and coconut oil. Knead the mixture until it comes together into a large ball. Divide the pudding mix into 8 portions and pack into the moulds firmly. Refrigerate for 15 minutes to firm. Remove from the moulds, peel off the plastic wrap and place on a tray. Meanwhile, to make the frosting, place the cacao butter in a bowl over a saucepan of boiling water and stir until completely melted. Remove from the heat and then mix in the coconut cream and maple syrup until well combined. Cool at room temperature to thicken the frosting, stirring occasionally. Spoon the frosting over the puddings and refrigerate for 10 to 15 minutes or until the frosting is firm. 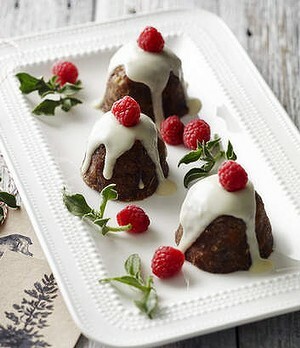 Decorate the puddings with some fresh raspberries and serve. Hot Tip – If the molds seem like a bit of a drag, roll the ingredients little Christmas bliss balls, which make ideal homemade gifts for friends and family. You can dip them in the frosting or just roll them in coconut or some toasted nuts and seeds.